Puffins are very sociable birds that like to nest in burrows in the soft sandy soil on Coquet Island. Photo by Paul Morrison. 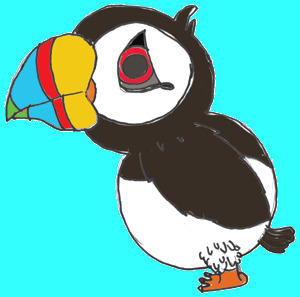 Plans are well underway for the Amble Puffin Festival which will be held at the end of May. The two week event takes place at the best time of year to see the Coquet Island puffins as they care for their newly hatched pufflings. The festival will take place in Amble from Saturday 18 May to Saturday 1 June. Throughout the fortnight, there will be something to interest all age groups, and activities will be held in a variety of locations throughout the town. Events will include local history talks, photo exhibitions, a local food and drink festival, street entertainment, arts and crafts and live music. There will also be environmental activities, such as guided nature walks, bird watching, pond dipping, crab catching, sand art and fun workshops in an eco caravan. “There is so much enthusiasm for this festival. Everyone loves puffins. I’m so excited by this, it’s turning into such a fantastic community event,” said Ann. We’d love to see any photos, pictures and puffin related stories (fact or fiction). If you send them in to The Ambler, we will endeavour to display them around town and on our website during the Festival.Please make sure you send us your name, age if under 18 and a contact address.Unfortunately, we will not be able to return any artwork. Our postal address is Fourways 2, 6 Dilston Terrace, Amble, Northumberland, NE65 0DT, and our email is editor@theambler.co.uk. From the harbour, visitors can take a boat cruise around historic Coquet Island. Weather permitting it will be possible to see and photograph the colony of some 36,000 Puffins who make this RSPB managed nature reserve their home. Puffins on Coquet Island are bucking the UK trend, because here their numbers are actually increasing. Coquet Island is also famous for being home to the UK’s sole colony of roseate terns as well as providing a safe haven for sandwich terns, arctic terns, common terns, kittiwakes, fulmar, eider ducks and grey seals. Please note, no landing is allowed on the island. You can follow the festival plans on Facebook (AmblePuffinFestival), Twitter (@AmblePuffinFest) and www.amblepuffinfest.co.uk.